zsIRC 2009.12.26 - see download page! Let's see if this Flattr thing works out. You can switch between the servers by opening the context-menu on the status window. I know this is suboptimal for non-touchscreen devices, but I haven't really figured out a way yet. I recently ran across this post, which is once again a proof that yes, IRC does work in a commercial environment, which I can understand in a way - after all, it's a fairly no-frills protocol, which makes it suitable for all sorts of hackery. Then again, it's strange. See, in my experience, or at least first hand impression, less and less people use IRC. I don't know why that is, although I have to relate to part of it - my first ever IRC experience around '95 was pretty dodgy considering that I had to accidentally find a magazine article that spilled what servers are available in Hungary, and generally it was a lot less intuitive... but that was before Google times - I guess the situation eased up somewhat with the tides of information available. So why do people IRC less? (If they do.) I've come to discover in the recent times that e.g. Skype's persistent chat/channel thingy is very much like IRC in terms of keeping a channel alive, with the added luxury of leaving your client in even if you're offline - something a lot of people do via BNC's and all that anyway. Another important thing about that (and new IM's in general) is that IRC offers no authentication as such: posing as someone else is ridiculously easy, although it's been literally years since I last saw even a ban, let alone a takeover or something. And then there's the whole high-level issue of privacy: when you join IRC, you pretty much accept the fact that people will see your IP address and all that. With other IM's, this is carefully occluded by the company who designs the protocol and the client (for the most part). Skype even offers a load of privacy options in case you only want chats from people on your list - which, admittedly, makes joining groupchats a whole lot more tedious and I still don't understand why there can't be a confirmation window, but oh well. Ultimately, IRC's charm comes from the simplicity and the community, which is why I guess it's still very much revered by e.g. the open-source crowd - but we have to admit that it's a niche thing. I mean, sure, even Microsoft gave it a shot (see Comic Chat), Unreal Tournament implements it, a lot of flash chatrooms are based on it, mostly because they want to avoid reinventing the wheel. But in the end it all boils down to what one wants from a chat client - Skype and MSN and Google Talk are pretty much fire-and-forget, while IRC clients are always a bit fiddly if you want them to work the way it's convenient for you. As a closing note, I would like to cite a story that enforces the notion that IRC is in fact a phenomenon: I was at a film festival some years ago, talking about the demoscene as usual, and a young lady working at a major film studio asked as the question - "Where do demosceners usually hang out? What's the main communication line?" So we told her about BBS's back then, and later IRC. Her eyes opened wide open and she said: "IRC?! I haven't been on IRC since I was 17!" ...and another one for the champagne. I'd like to give some credit to the V8D guys which I forgot last time for helping me out with a few things. Thanks! HO HO HO, MERRY HANGOVER! So yeah, new release as promised! Added: SSL / secure connection support (well that was easy!) 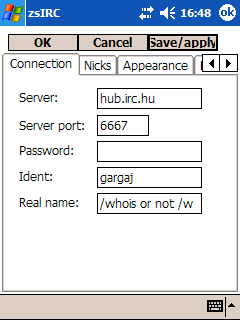 Use /serversecure <servername> [port] to connect via SSL. Thanks to m0nkee for testing! Also, as a minor note, I'd like to let you all know that I actually lost the sources a week ago, and then miraculously recovered it safe and sound - so no more complaints about me not being dedicated enough! I removed that annoying beep on Enter for some smartphone devices - thanks to JCO for the (fairly short) testing. New release for the Smartphone users. Fixed: Removed dependency to commdlg.dll, so it runs on more devices. Added: Smartphone softkey menu support! It should autodetect the device so you get the best menu you can. Big big biiiiiiig thanks go to Fixato for the domain and Negg for the Smartphone testing! FiXato registered zsIRC.com which is currently just a redirect, but I'll make sure it will be pointing here permanently. So use that, it's shorter. Big big thanks for him - it certainly made me realize that people actually care about the client. I'm getting sort of bored of the design here, especially because I want to do a proper webforum with logins, etc. ...new version of the client would be nice too. So yeah. I'm alive, and I check the forums regularly, it's just that e.g. I just moved flats and I don't even have furniture right now, so at the moment, zsIRC is lower priority than upgrading my daily sleep from inflatable mattress to normal bed. Please bear with me in the meantime, ok? I've been eyeballing secure connections for a while, but here's a question for someone with a bit more knowledge on the subject. If answered, I might be able to add the feature. Just a quick fix for the semicolon bug in scripting - thanks to AmigaHeret. Also, zsIRC failed to become a finalist in the PocketPCMag contest - which is unfortunate, but thanks for all the support anyway! zsIRC was officially nominated as Best PocketPC IRC application by PocketPCMag. Honestly, I have no clue how much this means, but it sounds nice... I guess. Use the forums if you have an opinion! Maintenance note: If you had problems downloading the .CAB file, because PocketIE would download it as text, please retry now! The needed MIME-type was added to the list, so it should work now - please note in the forums if it does or doesn't. HOLY SMOKES IT HAS GUI! AND STUFF. So yeah, hope you enjoy the fact that zsIRC is an actual PocketPC application now! I really want feedback on this one so don't be shy to use the forums, if you have anything to say. 2. I'm currently working on a new version which I plan to release after Breakpoint - new features will include the usual bugfixes, GUI (! ), CAB installer and maybe DCC too (depending on my mood), so keep a sharp lookout! Fixed: Added option for offscreen buffering - read .ini for details!! 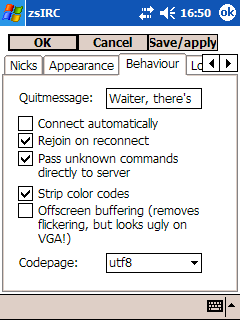 I got noted that the anti-flickering code removes smoothing from VGA fonts (which is strange, but it must be something I overlook), so now you can choose the lesser of two evils. Please note me on the forum if it's better now. 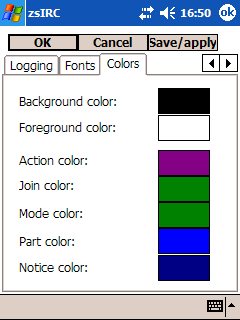 In other news, I just started the basics for a little GUI code, so cross your fingers. The codepage code might be a bit iffy since it attempts to actually detect whether a certain line fits your chosen encoding, and if it doesnt, it falls back to ANSI. Just try it out. Finally installed a devenv and now you can happily use the next version! As you might have noticed, updates are a bit scarce nowadays - the reason for that is my lack of an Internet connection at home. This kindof kills testing and such, but regardless, I'll try to churn out some new versions every now and then. Just a short note that I'm still alive, and I installed a development environment on my laptop now, so a new version might be happening soon. In other news, I recently got a mail from Brook Miles, author of PocketIRC; I deduct that he too is also still around, so you might expect a new version of PIRC too! No update this time, sorry; however, from now on, you can relieve your usual everyday pressure and headaches by donating some of your hard-earned dimes to me for no particular reason. You can do so and feel delighted here. Been a while. Kinda busy nowadays, sorry. Still not dead! Made a minor update, mainly fixes and finally a test for the copy function. As some of you might have noticed, the update-check feature didn't work. This was because I automated the feature by PHP, and hence the server switched to chunky mode transfer and it was unparsable for the client. Long story short, it's fixed now. This time it's more the conventience factor. Fixed: Weird crashbug on disconnect. Feel free to review the to-do list and comment in the forum or to send screenshots from various devices. This time it's some requested features. On a sidenote, I had a brief idea of having a "phone home" feature, which would send back your nickname and possibly the server to this site and it would be listed as "XYZ is using zsIRC on irc.abc.lol at 2006-%d-%d". Think of it as an automated on-demand testimonial. Drop a note into the forum if you have an opinion. Finally back from the horrible world of NO INTARWEB \o/ Site got updated a bit, RSS feed and forum, shiny new menu, stuff like that.